Tonight, I switched from al Jazeera International to BBC World Service. It took about twenty minutes before I quit with disgust and switched back. Here's what I saw. Somewhere at the World Economic Forum in Davos, there was a stage lined with eight armchairs ready for a live BBC program. Seated on the stage were Christine Lagarde, the current IMF director, a pretty African woman, likely representing the developing world, and several very important looking white men. 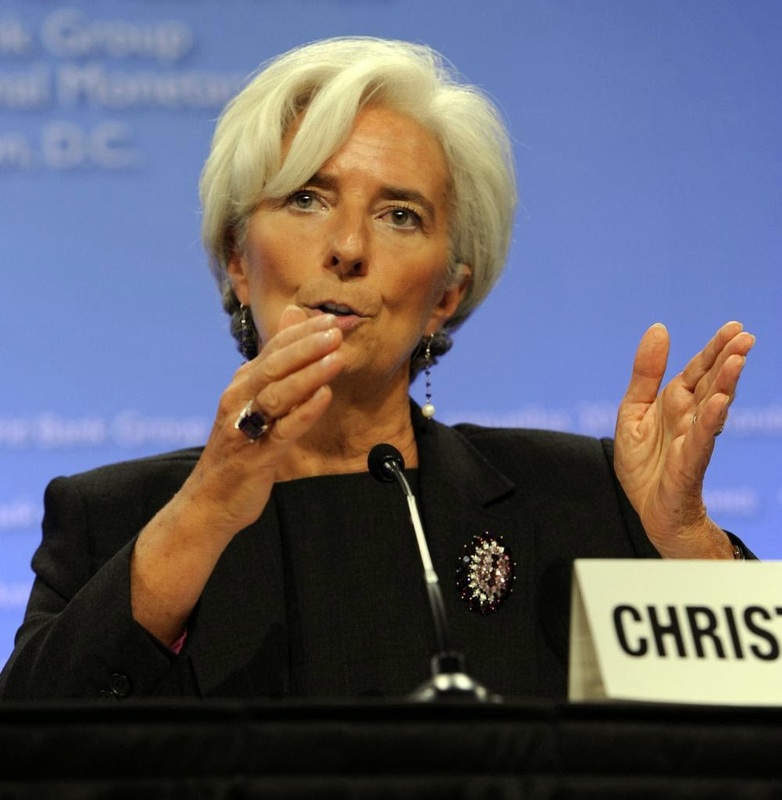 I started watching the BBC Davos report when Ms. Lagarde made her points: IMF is now anything but business as usual. Three IMF economists did a lot of analytic work and arrived at the following conclusions: (1) Extreme income inequality is bad for economic growth, (2) income redistribution is good for growth, and (3) jobs for the masses keep people engaged and are good for sustainable growth. She told us that these points were met with great disbelief and scorn by her IMF colleagues, who told her: "This is not main stream. This is not what IMF does." Well, now, Ms. Lagarde assured us, her thinking is main stream at IMF. OK, so far so good. Of course, Ms. Lagarde needs to check her definitions: Any growth that lasts for a while, leads to an exponential increase of economy and its resource needs, and this cannot be sustainable in the long run. A well known property of exponential growth is that each next doubling creates more needs than the sum of all needs before the doubling. For example, 1+2=3 is less than 2x2= 4, 1+2+3=6 is less than 2x4=8. How is it possible to continue this growth ad infinitum on a finite planet with finite resources and constant primary productivity? Wealthy Chinese have been buying tens of billions of dollars worth of real estate in California and New York each year. House prices even in small towns, like Arcadia north of Los Angeles, went up 40% for no reason whatsoever, other than the absentee investors parking their money in large empty homes. Imagine that the same Chinese double their spending this year, and then again next year. We will run out of real estate to sell to them. The rich Chinese are escaping the other blessings of a runaway economic growth in China: pollution everywhere, no clean air to breathe and clean water to drink, cancer, very expensive housing, and lots of cash focused in the hands of several thousands of business people. These business people smuggled out $1 trillion from China in the last decade to buy a cleaner environment in the U.S., Canada, Australia, New Zealand, England, and so on. It makes sense. We spend trillions of dollars asking China to produce the junk we buy, China destroys its life-preserving environmental services, and the business owners recycle our dollars back to us buying whatever is beautiful and clean in our country. We all envy China for their high economic growth rate. But should we? Still Ms. Lagarde was the bright spot in what I saw from Davos, despite her inability to answer simple questions starting from the pesky "Why?". After her there was a prancer, who said nothing, but tried to be funny. Then the African woman tentatively said something about lack of job creation, but no one paid attention, she was quickly interrupted and silenced, and the microphone went to a silver fox. He did some homework and from his notes rattled out that in 1928, the global poverty rate was 84 or so percent, while in 2011 it went down to 14 percent. Everyone sighed with relief and I switched back to al Jazeera. As a child, the driver lived in a small village surrounded by banana and other fruit tree groves. Twenty years ago, the villagers would have plots with vegetables and grain crops, and barter products at a local farmer's market. Today, when this driver goes home, there is nothing left of the trees and crops. Instead, there is a store that sells expensive Coca Cola and junk food. Most people in Ghana are now completely dependent on a large-scale distribution system to buy expensive, often foreign food. In one generation, the driver's village went from a healthy barter economy and good food (i.e., poverty) to buying unhealthy food from unknown sources with cash (i.e., not poverty). Mr. Progress has knocked on the driver village's door and stimulated the global economy. The driver had to emigrate to America to earn money so that his family could buy American food in Ghana. There you have it. In 1928, the global population was 2 billion people and in 2011, it was roughly 7 billion people. In 1928, most of the global population lived by barter outside of cash economy, and would be considered poor today. 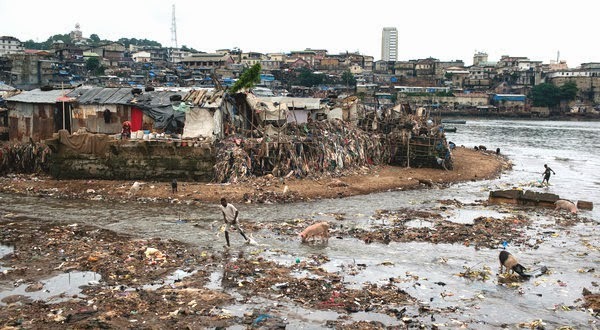 In 2011, more people lived in the big city slums around the world than the entire global population in 1928. These people may not be considered poor by the learned economists, but just look around, especially when you travel outside of Davos or watch al Jazeera, or go to almost any place in Africa, or in South or Central America, or to Haiti. What water do these people drink? What food do they eat? These people are definitely not poor. They have shoes and buy food with cash they scrape every day. And they live happily in the global economy, whose stewards I saw prancing in Davos. As one of the young American economists on the al Jazeera's "Stream" program noted: " I think that the main stream economists have a very weak understanding of sustainability." No kidding! If these clowns are our global leaders, God have mercy upon humankind. I imagine these people as the two-dimensional creatures crawling on a piece of paper and concocting theories as to why the third dimension does not exist.